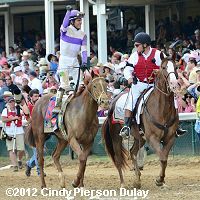 The 138th running of the $2 million Kentucky Derby (G1) Presented by Yum! Brands saw one of the most contentious fields in recent history. 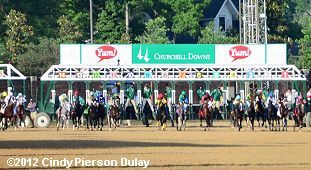 A record crowd of 165,307 crammed into Churchill Downs on Saturday, topping the old attendance record which was set one year ago. The weather cooperated, with overcast skies most of the day and temperatures in the low 80's, drying the track to fast despite heavy overnight rains. As expected, Bob Baffert trainee Bodemeister was sent off as the lukewarm 4-1 favorite in the full field of twenty, off his 9 1/2 length win in the Arkansas Derby (G1) at Oaklawn Park last out. 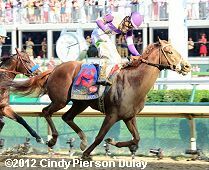 In to challenge him included 5-1 second choice Union Rags, off his third place effort in the Florida Derby (G1) at Gulfstream Park after winning the Fountain of Youth (G2), and 8-1 third choice Gemologist, undefeated in 5 lifetime starts including the Wood Memorial (G1) at Aqueduct. The rest of the field was at double-digits, including last year's Juvenile champion Hansen, all but dismissed at 13-1. I'll Have Another takes the lead from favorite Bodemeister during the stretch run with Dullahan on the far outside closing for third. When the gate opened at 6:31pm, Union Rags was bumped and shuffled back, while as expected jockey Mike Smith sent Bodemeister to rail and to the lead. The favorite set very fast fractions of 22.32, 45.39, and 1:09.80 while pressed by 45-1 Trinniberg to his outside, with Hansen and 26-1 Daddy Long Legs stalking the lead pair another 2 lengths back in third and fourth respectively. 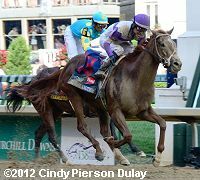 Union Rags trailed the field in 17th, encountering traffic trouble the whole way. Entering the stretch for the final time, Bodemeister had opened up a 3 length lead as Trinniberg and Daddy Long Legs tired and faded from contention, getting the mile in 1:35.19. Bodemeister held his 3 length advantage to the 1/8 pole, but 15-1 I'll Have Another, who settled in 6th on the outside away from traffic, was moved to the far outside for room by jockey Mario Gutierrez and was quickly gaining on the favorite. Inside the 1/16 pole. Bodemeister tired enough for I'll Have Another to run by him to win the Derby by 1 1/2 lengths in 2:01.83 over the fast main track. 13-1 Dullahan rallied strongly from 11th but just missed second money by a neck, and it was another 3/4 length to 30-1 Went the Day Well to complete the superfecta. Left: I'll Have Another with his Derby roses. 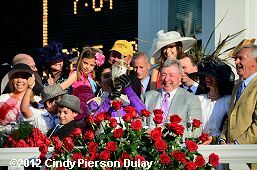 Owner Paul Reddam said, "Horse racing is the most dangerous kind of addiction because it has intermittent reinforcements, right? Every once in a while something good happens, and that keeps you gambling or buying horses. To win a race like this, everything has to go pretty much according to plan. That's the way it's been since the horse started back this winter. Doug had a plan and he followed the plan, and the horse was doing super every day. We kind of greet each other every day with, Well, so far, so good. That went through today. I'm just so excited for Doug and Dennis who picked out the horse, Mario. I was telling some folks that was the second time Mario has ridden on the dirt at Churchill, and the first time was earlier today. We got him the experience he needed. Went off flawlessly. Really happy for the whole team." Right: Jockey Mario Gutierrez kisses the Derby trophy while trainer Doug O'Neill and owner Paul Reddam watch. Reddam added, "There was some karma today because it was Cinco de Mayo and we rode the Mexican rider." Left: I'll Have Another in the post parade. 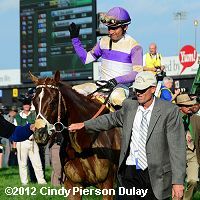 His trainer Doug O'Neill said, "I think he was such a prize because of me training it and Mario riding it. If it would have been a Pletcher or Velazquez, I bet you it would have been 9-2. 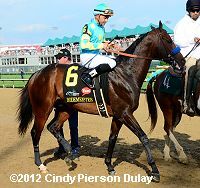 How do you win the Santa Anita Derby and not be one of the top five choices? I know the Beyer numbers. He didn't put up crazy high Beyer numbers. When they win the way he did, we were super confident in this colt. When you tell people you're in the horse racing game, they ask you, Have you won the Kentucky Derby? Now I can say, Yes, I have, 2012. My brother Dennis, he's been there with me through the ups and downs, and there's been a lot of downs. So this is incredible, and I'm going to soak it up as long as I can." Right: I'll Have Another walks over to the paddock before the race. Left: I'll Have Another parades for the fans after the race. His jockey Mario Gutierrez said, "I was in British Columbia at Vancouver (during last year's Derby, watching it on TV), where I've been doing all my racing since 2006 pretty much. 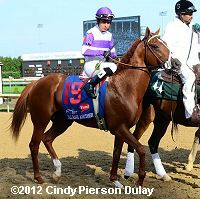 I saw Animal Kingdom win the Kentucky Derby. Like all jockeys, we all dream that one day fortunately I would be in the Kentucky Derby. At that time I was at Hastings Park and of course like a joke I had the dream, but I wasn't thinking it was going to be the next year. He broke sharp, as he usually do. He's such a professional horse. He's a really calm horse. I know he was going to help me 100% through the first part. In the end, he just give 100% all the time. As soon as you ask him, he throws everything on the race, and he didn't disappoint today." Right: Mario Gutierrez celebrates after crossing the finish line. Left: I'll Have Another leaves the winner's circle. Jockey Mario Gutierrez added, "I know my horse was reaching every single step of the way, but I wasn't going to stop riding until I was passing the wire. That is when the horse race is finished. He's a really smart horse. I let him run a little bit to have that position. He's so smart, he does everything pretty well. I just waited for him, push him a little bit to have that spot, and then everything from then on was from the horse. I'm from Vera Cruz in Mexico. My dad was a quarterhorse rider in Mexico City. We only raced in the match races. He was training horses. I always wanted to be like my dad." Right: The horses round the clubhouse turn during the 2012 Kentucky Derby. Left: Second place finisher and beaten favorite Bodemeister walks over to the paddock before the race. His trainer Bob Baffert said, "He was doing it easily. He was within himself. He was being pressed, but he's a brilliant horse. That's the way he wanted to run. He was there and he just got tired a little bit. He's only run four times. I was really proud of him. You get beat. But he showed up and that's all a trainer can ask for is that his horse shows up on the big days. That's the only time I've run second where I've been happy because he ran his race." Jockey Mike Smith added, "I'm very disappointed, but at the same time I'm just so proud of him. He's brilliant. He was flying leaving there. He was two in front leaving the gate. He didn't finish first, but he's still the winner. He's such a free running horse that I couldn't take that away from him. At the top of the stretch, I really thought we had it, but I knew we were in trouble." 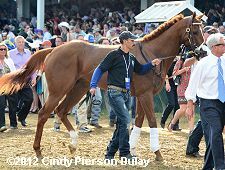 Right: Third place finisher Dullahan in the post parade. 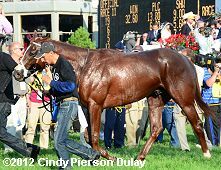 His trainer Dale Romans said, "I told Kent to get out in the clear, and he came running. He had to go a lot wider than he wanted to, but he finished strong. It was just an unlucky break." Jockey Kent Desormeaux added, "He was starting to get disgruntled because of all the sand he had eaten. I was encouraging him to go faster but he was slowing down. When I made my move turning for home, two horses peeled out in front of me and I ended up going nine wide." 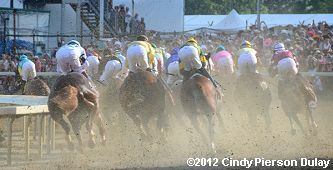 Left: The field breaks from the gate for the Derby. 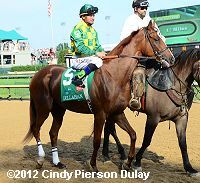 Julien Leparoux aboard 8th place finisher Union Rags said, "He broke a step slow and he usually breaks well from the gate. Then he got bumped and we dropped far back. After the first turn and on the backside, I tried to find room inside but I had nowhere to go where I can make a move. At that time, I knew it was going to be tough to come back. It's unfortunate." Right: The entire field shortly after the start of the Kentucky Derby.